I celebrate deep connections between humans and nature by making sculpture, earthworks, and maps in the tall grass prairie. Our home and my studio are just north of Matfield Green (pop. 68) in the heart of the Flint Hills of Kansas – the largest tract of untilled tallgrass prairie in the world. We live on an historic railroad property and enjoy/endure seventy freight trains each day. The prairie and the BNSF are rich in materials for sculptural exploration. Being rooted here as citizen, property owner, prairie manager, and naturalist nourishes my work as an artist and kindles my desire to share connections to nature with others. 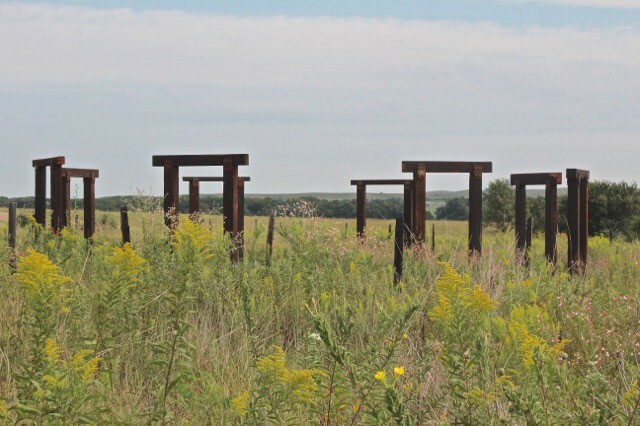 I do this through individual creations – small sculpture, fire circles, land forms, and maps; and by welcoming visitors to Matfield Station PrairyArt Path – four miles of paths in untilled prairie, breathtaking views, and sculpture.